Ruben Enaje, centre, in white, being crucified today. Picture by Reinhard Feichter. A man who has been crucified every Easter for the past 32 years says it no longer causes any pain to be nailed to a cross. Ruben Enaje, aged 58, has taken the role of Jesus Christ at the Cutud Lenten Rites since 1986. Speaking after today’s Good Friday (March 30) crucifixion in San Fernando, the veteran ‘penitent’ claimed the ordeal no longer caused him pain. Mr Enaje credited his Catholic faith for protecting him from feeling pain. “I feel like he is telling me ‘go ahead, keep it up’,” he said, presumably referring to God. Mr Enaje is already looking forward to next year’s rituals, and said he felt strong enough to perform in two or three more crucifixions, at least until he retires at 60. 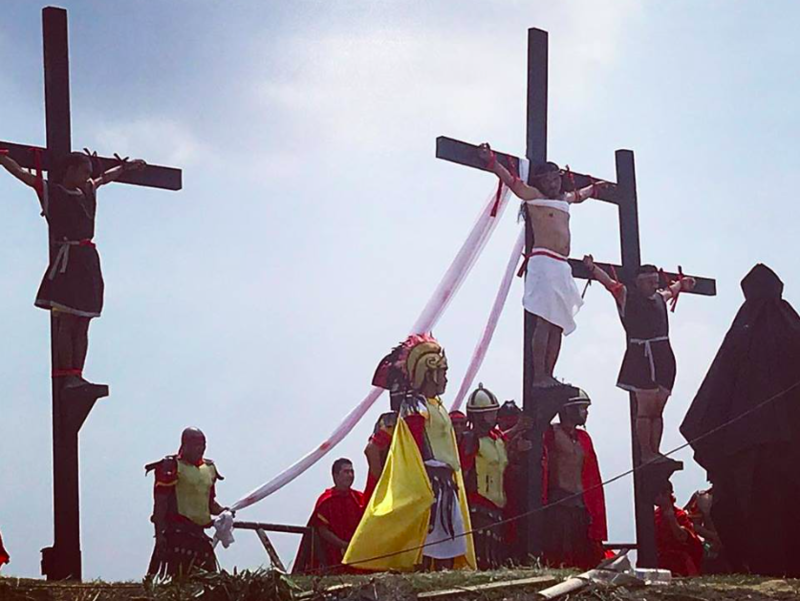 Mr Enaje was among nine devotees who volunteered to be nailed to crosses today, including one woman — Mary Jane Sazon, a 39-year-old beauty salon worker. Locals dressed as Roman soldiers attached the devotees to their wooden crosses by hammering two-inch nails through their hands and feet. An estimated 50,000 spectators, including both domestic and foreign tourists, were on hand to see the crosses hoisted into place. The Catholic Church in the Philippines tolerates the ritual but says it does not support such gory displays of devotion, describing them as a “misinterpretation of faith”. Speaking today, Archbishop Socrates Villegas said Catholics should mark Lent in prayers and acts of love and charity. “Instead of spilling your blood on the streets, why not walk into a Red Cross office and donate blood? Choose to share life. Share your blood,” he suggested. However, many believe the penance cleanses sins, cures illnesses and can even make wishes come true. Intentionally or not, these people are horribly cheapening & distorting what Good Friday means. –They were not whipped mercilessly. –They have no crown of thorns. –They did not suffer a sleepless previous night of beatings, mocking, and sham trials. –They did not have to drag a cross up a hill. –They are not hanging on the cross; they’re standing on a small platform. –They don’t have huge spikes in their hands (wrists?) or feet; they only have little 2 inch nails. –They were not facing a slow, agonizing death of gasping for air with each push of their feet against the spike; they’re getting an ego boost. –They are not bearing the weight of the sins of the world. –They are not grieving the loss of the heavenly Father’s presence for the first time in all of eternity. (“My God, my God, why have you forsaken me?”) They may not have ever even felt the Father’s presence. –They are not paying for or cleansing even the smallest sin by this charade; Jesus is the only One qualified to do that, because only he never sinned. He believes his Catholic faith protects him from pain. Or could it be that after 32 times he just uses the same holes in his hands?